I just can’t resist that sweet green caffeinated nectar of a Mountain Dew, however, I have recently and unwillingly had to give it up. It seems my doctor believes that the amount of sugar in Mountain Dew and my excessive intake is just not good for my diabetes. I personally think it is a conspiracy between my wife and my doctor to torture me, although they claimed to only be concerned with my health. Despite my paranoia, I decided they had a legitimate point and sadly drank my last Dew a few weeks ago. Well it only took a couple a of days before the crankiness set in and the throbbing pain of what my doctor so lovingly called “caffeine withdrawal headaches”. Caffeine headaches? Really? The paranoid side of me started to wonder what they really put in Mountain Dew? I shook off that crazy thought and eventually came to my senses, put away my tinfoil hat, and begin to look for an alternative fix. As I frantically rummaged through the kitchen, I came across an old dusty coffee pot hidden in the back of the pantry. Eureka, a source of caffeine with no sugar, I can’t possible go wrong here! I never have been a big coffee drinker but that was about to change! Since we only break out the coffee pot for company, it took a bit more rummaging before I was able to find what I needed. One stale can of coffee-it will have to do for now, paper filters, and one coffee cup from the “good dishes” I am not allowed to use. I never understood why we needed a set of “good dishes” just for company, but I digress. Intent on curing my headache with as much caffeine as possible, I quickly begin the task of setting up the coffee pot. Within a few minutes the kitchen was filled with the smell of fresh brewed coffee. Stale coffee or not, the aroma was overwhelmingly intoxicating, which only intensified my craving. While it only took a few minutes to brew-it felt like an eternity- with every drip of the coffee pot slowly torturing me. I wonder what Attorney General Eric Holder would have to say about that? The coffee pot then began to gurgle as if it was dying, signaling me that I could finally have a hot cup of caffeine coffee. It wasn’t the greatest cup of coffee, it was very bitter tasting but it was serving its purpose and it didn’t take long for the effects of the caffeine to kick in. As started on my second cup, I could feel my heart rate increase and the throbbing in my head begin to fade away. I had soon emptied the entire pot(8 cups)and happily found the way to my office. I am sure all that coffee was not good for me, but I was feeling so much better that it didn’t really matter. It also made for a very productive day-I think-as I bounced off the office walls from my caffeine high. I was now talking nonstop as I was fielding the phone calls that seemed to come in one after another. I do apologize to the brave souls that called me that day, you must have thought I was crazy and I hope you can forgive me for rambling on. I can’t say that I didn’t enjoy this day and the energetic feeling the coffee provided, but I knew it was going to wear off soon-resulting in that typical caffeine crash. This all occurred about 6 weeks ago and I am still starting my day with a pot of coffee and just a bit more self control. It doesn’t seem very wise to replace one vice with another, so I have been considering cutting back on the coffee too. Although, I doubt that will happen any time soon. Some would say I just have an addictive nature but I prefer to think that if you enjoy something-then enjoy it as often as you can. One of the great benefits of hosting with TotalChoice Hosting, is being a true part of our family. I can not express how many times a confused client has approached me inquiring about an account upgrade. Just recently I have been helping a client with a large amount of shared hosting sites make some choices on how to upgrade. Mike Ford, owner of newyorkmustangs.com , has been a happy TCH client for over 5 years. During this time Mike has grown from one shared hosting account to over ten shared accounts. Each time adding a new account with a smile. Mike was ready to order his 11th account, however this time, he approached TCH asking about his options. TotalChoice offers many upgrade options. I explained to Mike that moving into a reseller account would be the next logical step. This would allow Mike to host unlimited domains within the allotted disk and bandwidth space. I explained that a reseller account was still on a shared server. However, Mike really wanted to have full control. He wanted to add as many domains to his account as humanly possible. I explained to Mike, that a fully managed dedicated server was the way to go. After a few days of back and forth questions, Mike looked around and shopped the competitors. In the end, Mike choose to host his new dedicated server at TotalChoice Hosting. Thank you Mike! I know you will be pleased with your new server! We all have something that helps us to relax and unwind. An outlet where you can get lost in the joy of what you are doing. A hobby provides small moments in one’s life that allows you to be you. A hobby reveals the passion in a person. For me, this is baking. My fixation with baking began in third grade. I came home from school to find the Fairy tale world of Hansel and Gretel in the form of a cake. This was my birthday cake. It had a graham cracker house held together with icing and candy cane posts. The roof was covered with candy and a gumdrop chimney. There were licorice lined windows and a brown sugar path leading to the house. This was the greatest thing my nine year old eyes had ever seen. I knew then that one day I would make my own sweet creations. I learned all I could from my mother and family members that were willing to put up with me. I continued to bake as I grew older. I helped my mother make cakes, pies, cookies and candies. But my passion lies in cakes. There is no limit to what you can do with a simple cake recipe and a few extra ingredients. I think of a cake as my canvas and icing my paint. I am no “Ace of Cakes”, but I enjoy the building and creativity of making a cake. I have made cakes for baby showers, weddings, anniversaries, retirement, birthdays and other occasions. It is an unexplainable feeling to know that you have contributed to someone’s special day. 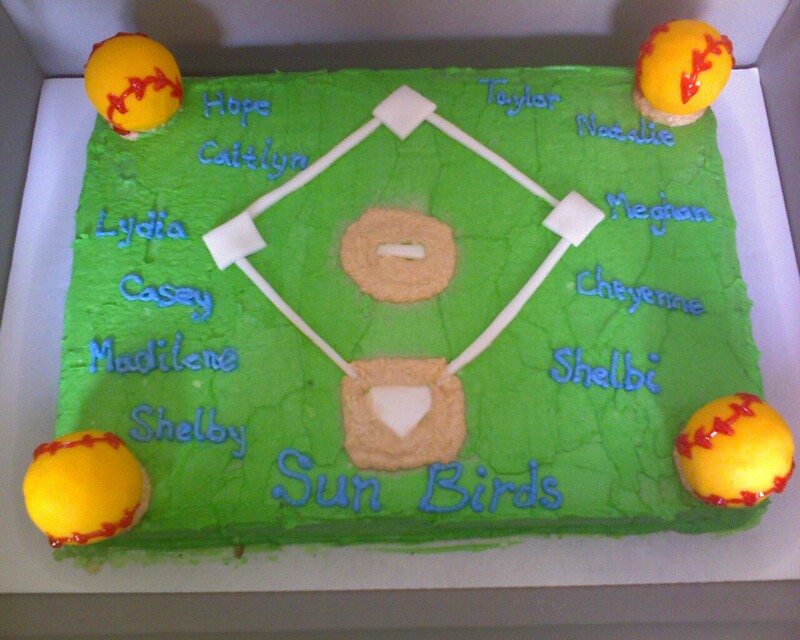 I recently made a cake for my Daughter’s softball opening day. I made a baseball diamond in the center of the cake. I then placed four Marzipan cover Styrofoam balls on each corner. These were made to resemble softballs. Each girls name was written on the cake. The cakes were auctioned off to help the league with regular maintenance of the field. I was so excited when my cake went for $175.00. The team was overly excited when the gentleman who purchased the cake returned it to them. We were all able to enjoy the cake. My son’s birthday was this last weekend and of course, I had to pull out the cake pan. He loves John Deere tractors. I was able to find a small John Deere toy tractor to build a cake around. I air brushed the grass on the cake and placed a fence and trees on this area. 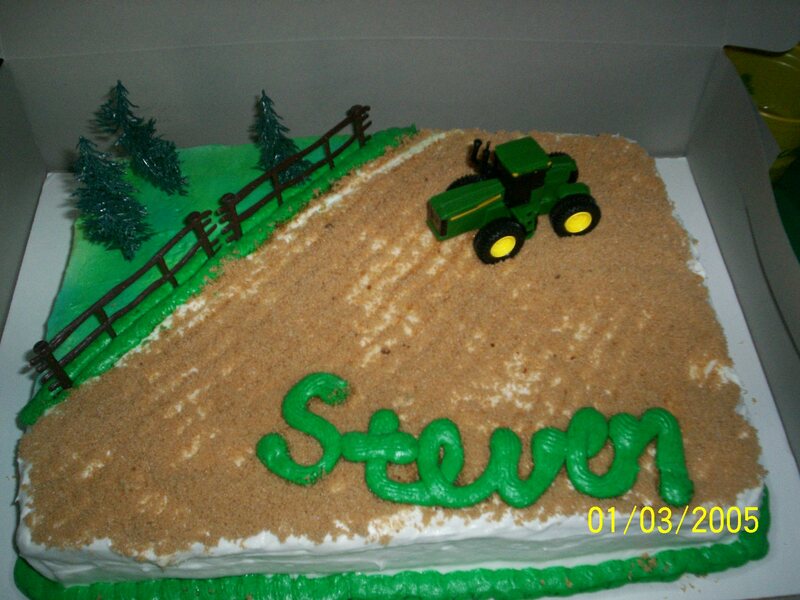 The rest of the cake was covered with brown sugar and combed to resemble plowed field. The tractor was placed in the field. I recently discovered a Firefox Add-on called FoxTab, and I love it! Therefore, I decided to share this with you. As some of you might not know about it yet. The latest version just recently updated on February 8, 2009, but it first surfaced back in September. With the raving customer reviews and over 700,000 total downloads, FoxTab is really catching on with the Firefox installed user base. Because I use FireFox as my default browser, I find this add-on to be the coolest one yet, and much helpful while working with multiple open tabs. It is a breeze to install and get started with. Once you hit install and restart the browser a FoxTab icon appears in the browser toolbar, between the home button and the URL line. A user can select and deselect open tabs, by using a mouse or a keyboard arrows keys. There is also an alternative to Alt-Tab shortcut, for a quick tab switch between all open tabs. 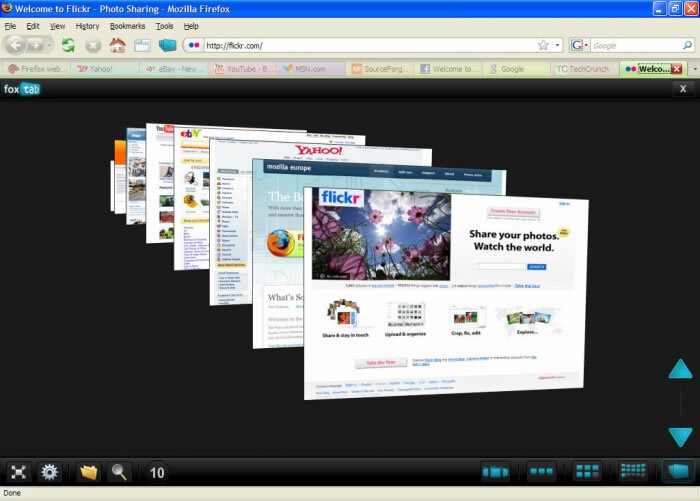 This is where a user has an advantage of selecting a desirable tab at first try, due to a full display of all open tabs. There is also an option to Filter your open tabs, by clicking on a “folder” icon on the bottom left and then selecting a group of tabs from a common domain. For example, if I have 10 tabs open and 3 of them are TCH site, TCH blog and TCH forums, buy selecting the TCH group, FoxTab will isolate those 3 out of all 10. The FoxTab display size is also adjustable to a users preference, and it has 5 different layout options to choose from. If it is something that user does not wish to have it is easily to uninstall. I think all these futures make the FoxTab a great Add-on for any FireFox user, allowing them to browse with a breeze. Try it out. 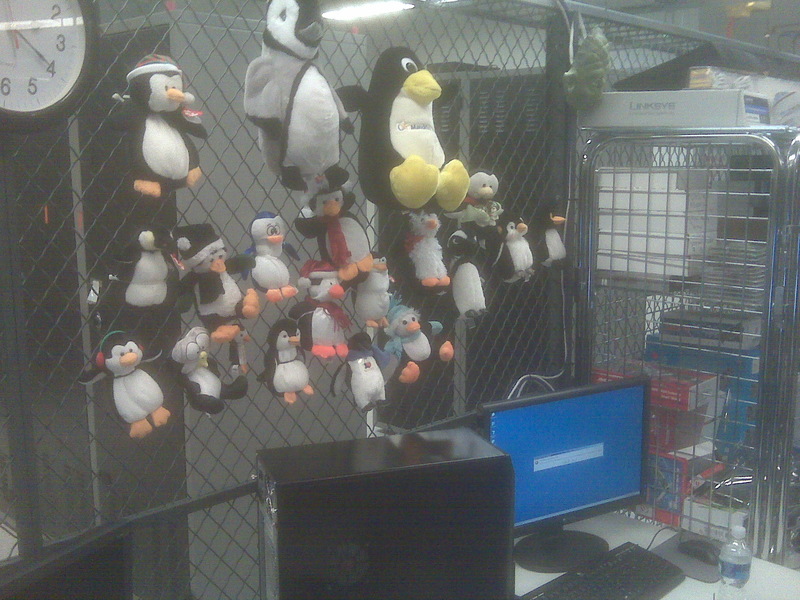 The TotalChoice Hosting wall of Penguins! Collection has been ongoing for about 2 years now. If you would like to add to our collection, please feel free to mail us your penguin.